Google's search interface for tablets is great, but it lacks some of the features from the regular interface. One of the most important missing features is the link to the cached search results. Sometimes a site goes down, a page changes a lot or redirects you to a stripped-down mobile interface and Google's cache is really useful. Now you can switch between the tablet interface and the classic interface using a link displayed at the bottom of the search results page: "View Google in: Tablet | Classic". 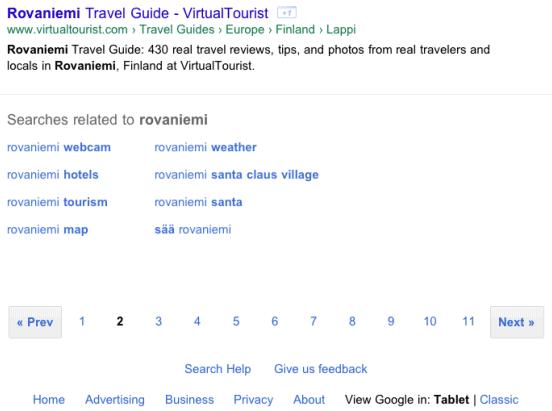 The nice thing is that Google remembers the query and sends you to the same page of results. Other missing features from the tablet interface: the number of search results, the link to the advanced search page, the "something different" section, the smart sidebar that shows the most relevant specialized search engines and options, while hiding the other features. While these options are still available in the tablet interface, Google no longer highlights those that are the most relevant. To switch to the classic interface, Google adds "&nota=1" to the URL (there's a similar parameter for the mobile interface: "&nomo=1"). While there's no way to permanently switch to the classic interface, you can bookmark this URL to access it: http:/www.google.com/webhp?nota=1. Great! Tablet interface has too much whitespace (just like all the other new google UIs, and they don't stop with all the complaints!!!) And when holding landscape I have a nice wide screen yet all the search options are above the search results, not on the left meaning i can see more results without scrolling and taking up whitespace on the right. thank you, thank you, thank you, thank you, thank you, thank you, thank you, thank you, thank you, thank you, thank you, thank you, thank you, thank you, thank you, thank you, thank you, thank you, thank you, thank you, thank you, thank you, thank you, thank you! Old is Gold. Happy to see classic mode on my tablet. Classic is much better for me. maybe Google did that because there is less space for any tablet .. so they are compromising some feature for the sake of size ..
please moderate the comment dear admin..
To get a classic search. I can't stand scrolling down and changing the mode every single time I use it. This is a good thought. I am very much sure that its gonna help lot of tablet users. I would like to know how to view GMAIL in classic mode. As of yet I have not discovered a way in which one can access standard classic options, like editing ones labels, from a mobile device. When I choose google classic then browse to gmail, it reverts to tablet mode and there is no option for switching to classic once in gmail. Please help.